Indulge in a desert beauty ritual at Dubai's Spa CORDON. During this 4-hour experience, receive 3 different Arabian-inspired aromatic treatments: a 45-minute hammam bathing experience, a 1-hour essential oil massage and a customized 75-minute facial with a cold stone eye treatment. Take advantage of the spa's ultra-pampering facilities like a steam room, sauna, whirlpool and rain shower. Complimentary refreshments and round-trip hotel transportation are included. Following pickup from your central Dubai hotel, travel to the luxurious Spa CORDON. After check-in, explore the facilities, which include a sauna, whirlpool, steam room and tranquil relaxation lounge. Enjoy a welcome drink and begin your desert-inspired beauty ritual, which uses a combination of healing scents and spices cultivated from the Arabian desert. Take your choice of sauna or steam, whirlpool or refreshingly cold rain shower before beginning your 45-minute hammam. During this traditional Turkish bath, lie on a heated marble slab while a practitioner lathers you with black olive soap. The practitioner will use a kessa, or exfoliating glove, to boost circulation and invigorate your skin. Move on to a 1-hour massage using nine different essential oils. Relax as your practitioner treats you with a poultice of Arabian Gulf spices and a dry brush. Feel the tiny drops of sesame and almond oil as they are applied down your spine. The next step in your beauty ritual is the 75-minute customizable Ultimate Facial. Using products made from natural ingredients, your practitioner will apply a 3-step masque and a cold stone eye treatment that will leave you glowing. After three hours of deep relaxation, take a quiet moment in the lounge. Eat a light snack and enjoy a refreshing drink before returning to your hotel for drop-off. Excellent facility which was so tranquil and rejuvenating. 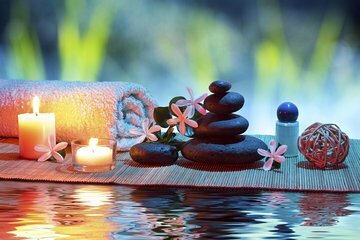 The treatment was wonderful and relaxing and I'd would book again in a heartbeat.